The proverbial rubber is about to hit the road. With a bit more than a week to go, I’m pulling together gear for the NZ adventure. As photography has usually been part of my adventure planning (if not always part of the execution), I’ve been thinking about what to take with me. It needs to be compact, relatively light and convenient for motorcycle travel as well as some day hikes. The camera is easy. My Fuji XE-2 has been my mainstay for a while. Say what you will about DSLRs and you’re probably right both for better and for worse. For my purposes, I decided they’re just too heavy and bulky for the kind of travel I like to do. 16-55mm that came with the camera (24-72mm equvalent). A good lens that is far better than most “package” lenses usually are, and a real surprise to me when I got the camera. Compact 27mm (42mm equiv.) pictured here, that has become my fave for general photography. It really makes this camera feel like an old-school Leica. Slightly wider than normal makes it perfect for me as I tend towards wide rather than long lenses. 55-200mm (72-300mm equiv.) is my only long lens and useful to me in some landscape and outdoor situations. I tend not to go long very often, but when I want to I really want to. 14mm (21mm equiv.) that I’ve lusted over for a long time and finally picked up on a particularly good eBay deal. I don’t want to load myself down with all of them. After some anguish I’ve decided the 16-55mm is the one that will stay home. What would generally be considered the most versatile piece of equipment will remain behind. Nobody’s ever said I make things easy for myself. 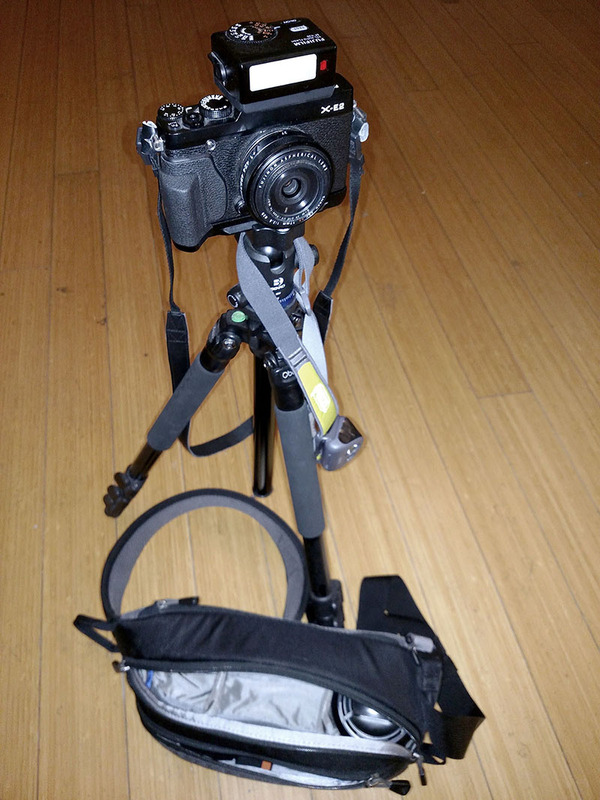 The camera, two extra lenses and my compact flash unit all fit perfectly into the ThinkTank Turnstyle 5 sling bag that I prefer to use. Along with those, I can also fit a couple of extra camera batteries, a spare SD card and a handful of other minor accessories. Keeps it simple, compact and lightweight. Doing this while traveling light is a challenge. There’s no way I’m bringing my heavier Manfrotto setup that I’ve had since the DSLR days. Wonderful to use, but too heavy and bulky. So I begged, borrowed and bought a new setup consisting of a lightweight aluminum Oben AC-1421 and a Benro IB0 ballhead. I’ll probably never extend it all the way as it does get pretty shaky, but it’ll serve it’s purpose. Thanks friend (you know who you are) and double thanks eBay. That’s a Petzl Tikka+ headlamp that includes the eye-saving red light mode. If you’ve ever struggled with camera controls at night you know how important this is. It’s not strictly photo gear – I’ll certainly use it every night for other things – but it’s essential for photography when the lights are out. A couple of rain covers for the camera. New Zealand weather is going to be far less predictable than California’s, and I’m going to spend a couple of days kayaking, so protection from spray is a good idea. Probably will bring the small Fuji flash, also pictured here. I don’t use it a lot, but when I want to the tiny on-camera flash is rarely sufficient. It doesn’t add much to weight and fits readily into the bag. Beginning to really look forward to this.